The Royal Engineers Living History Group is an informal group of history enthusiasts, dedicated to keeping alive the memory of the Royal Engineers and their times. Using period clothing and equipment, we seek to bring alive for the public daily life in the colony of British Columbia nearly 150 years ago. This website represents the results of our ongoing research into this fascinating period and thus is perpetually under construction. Please be aware that this web site is in a state of perpetual update, as we receive new information from archival sources as well as from descendants of the Royal Engineers at such a rate we have yet to post what we already have. The original purpose of this website was to share information among ourselves. As such, early on, we did not note all the sources of the information presented herein. We most humbly request that should you find unaccredited information and can supply the source, please pass it along so that we might rectify the oversight. part of a series he did for Confederation Life. 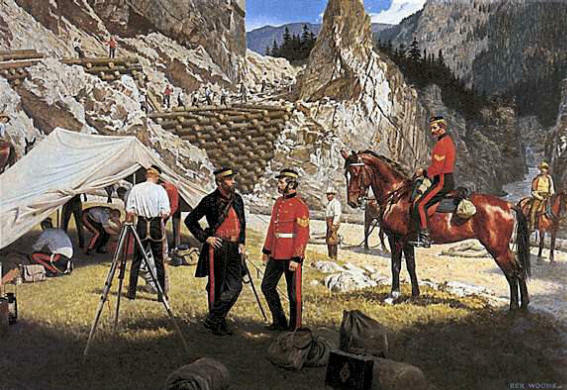 A tiny military force in a vast and boisterous gold rush colony, the 220 men of the Royal Engineers laid the foundations for much of British Columbia. This was a colony created by gold. Word of rich strikes on the Fraser River reached San Francisco in 1858. Within twelve months, some 30,000 gold-seekers had poured into the region. The few hundred British residents, Hudson’s Bay Company employees and farmers, were overwhelmed and sought help from the Colonial Office in London. The answer to their plea was the Columbia Detachment of the Royal Engineers, 160-strong, under Col. Richard Moody. An advance party of Engineers built barracks at Derby Reach and were on hand at Fort Langley in November 1858 for the ceremony creating the new Crown Colony of British Columbia. The bulk of the force arrived the next spring on the sailing ship Thames City after a four-month journey from England. The job of the Columbia Detachment was three-fold. First, they would carry out a program of public works, surveying townsites and building roads. Second, as a military force they would guard against the dangers of American annexation and Indian uprising. Third, they would create a British presence in the colony and “promote a high social standard of civilization” for this new frontier. An additional 65 Royal Engineers and their officers were to assist with the work of the British Boundary Commission. By an 1846 treaty, the boundary with the United States was fixed as the 49th parallel from the Rockies to the Pacific. Now it fell to the Commission to survey and mark this line across some of the most rugged terrain in North America. The contributions of the “Sappers” to this new colony were many. They oversaw the construction of badly-needed roads, including the magnificent 400-mile Cariboo Wagon Road into the interior. From their headquarters in Sapperton, they laid out the capital at New Westminster, set aside Stanley Park as a military reserve, and built public offices and churches. They produced maps, surveyed lands and settled miners’ disputes. Just as critically, most of the enlisted men with their families stayed on as loyal and productive settlers after their military service was completed. Above all, the Royal Engineers ensured this Pacific colony would remain a British possession, paving the way for a Canada stretching from sea to sea. 1st Encampment of U.S. Land Boundary Commission, Esquimalt, V.I. Please follow the link to our Index for a detailed listing of the information to be found on this site. For an overview of a soldier’s life in the Columbia Detachment, you may wish to start with our Introduction.